GoChengdoo is the online spin-off of a monthly magazine covering all the latest news and events in Sichuan province’s capital city. GoChengdoo’s greatest strengths are its Travel and What’s On sections, the latter featuring events spanning from weekly bar specials and Chamber of Commerce networking mixers to the city’s biggest music festivals. The Travel section has beautifully written articles with stunning accompanying photos that describe unique locations within Sichuan and surrounding provinces, often detailing places that one may not typically find in a guidebook or any other English-language sites. The ‘Reviews’ area is also a great resource for restaurant information; the website’s active user base is consistent in delivering their opinions on Chengdu’s vast range of food and drink establishments, whether international or Chinese. Regular contributions to the Classifieds section are also a strong point as users can view jobs offered, housing/rentals, as well as items to buy/sell – including “rare” finds for sale by foreigners such as coffee makers, e-bikes, and dogs. 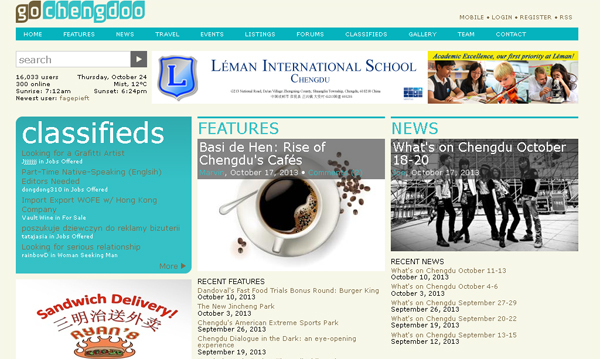 One of the site’s weaker points is its forum, which is often spammed or used as a sales tactic for local businesses. In contrast to GoChengdoo, Chengdu Living has a well-maintained, lively forum populated by locals and foreigners engaging in discussion. New items, events, bar/dining specials and promotions are often circulated through the forum, accompanied by never-ending banter and debate. The forum alone is an excellent resource on life in China, with guides to using TaoBao (Chinese eBay), advice on buying property, English-language job offers in the local hospitality industry, detailed information on unique events run by the expat community and general q&a for newcomers to the city of spice and pandas. 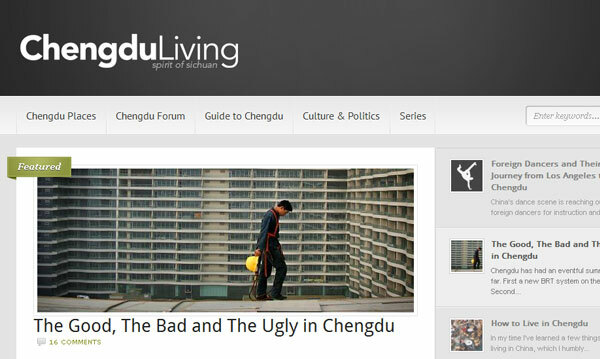 Chengdu Living also features beautifully written, magazine-style articles by several long-term expats. Topics are distinct and range from interviews with a local Jiu Jitsu expert, a guide to marijuana in Sichuan, a how-to on bypassing visa fines, buying tea in Chengdu, a series on giving birth and raising a child in China from a foreigner’s perspective, as well as things like business, language, culture, and love-related features. Although many of the articles take a uniquely Sichuan-ese angle, the information found here can be applied to life in any city in China. A more recent addition to the site is “Chengdu Places”, which lists tourist attractions, restaurants, bars, shops, parks, transportation and more either by category or by area of the city. Reviews are well-written, thoughtful and feature quality photos as well as price range, Chinese address details and Google Map. Posted on October 23, 2013 by danielleflaing. This entry was posted in Cities and tagged Chengdu, Sichuan. Bookmark the permalink.